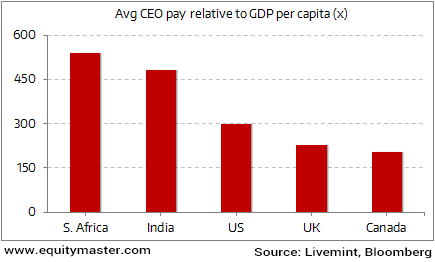 What the average CEO gets paid in India looks an innocuous when compared to countries the US and the UK. A Livemint report points out that the average CEO in the US and the UK gets paid more than 5x and 3x respectively than its Indian counterpart. So far so good. But once you put these numbers into perspective, the scenario starts looking very different very quickly. As today's chart shows, once you compare the CEO pay to GDP per capita in the respective countries, India comes in second in the world! Only South Africa ranks higher. And the US comes in a distant third. So while average Indian CEO gets paid 483 times India's GDP per person, the US CEO gets paid a much lower 299 times. What these numbers essentially tell you is that the difference in what CEOs pay themselves versus the standard of living of the average person in that country is very large indeed. And much larger than even much more developed countries like the US, UK and Canada.